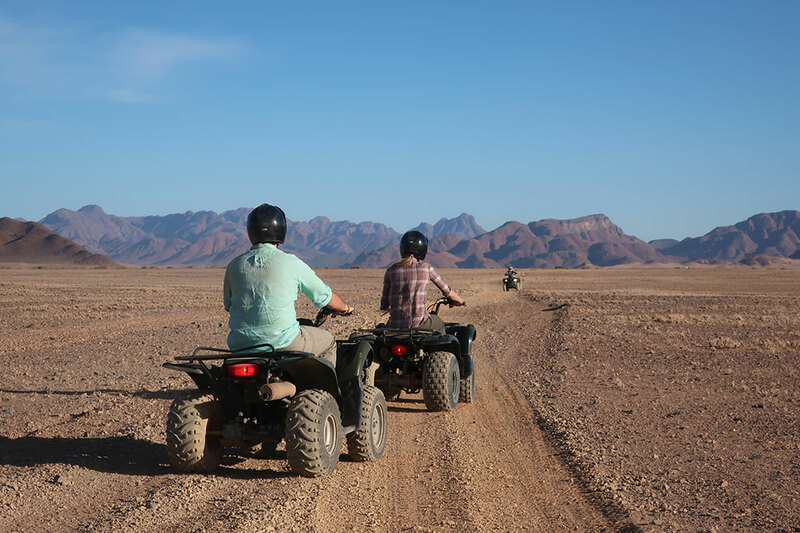 A quad-biking (ATV) excursion in Namibia may sound suited only to tourists who prioritize adventure over actually seeing things. Indeed, I usually do ATV excursions only after I’ve exhausted all the other activities I wished to accomplish. But on our recent trip to Namibia, I was reminded just how fun and memorable ATV excursions can be. At Little Kulala, we decided against joining another game drive and hopped on some ATVs for our last sundowner excursion. After our guide managed to find a helmet that fit my (apparently oversize) head, we crossed the dry riverbed at the property’s edge and zoomed off into the rocky desert. Surprisingly smooth roads of dirt and gravel curved around a gently rolling plain of dark, parched earth topped with a golden fuzz of desiccated grass. In the distance rose worn-out humps of black and red rock, the remains of mountains and volcanoes hundreds of millions of years old. Atop my ATV, I felt much closer to this extraordinary landscape than in a vehicle. And it allowed us to cover much more ground, of course, than walking. Numerous animals manage to survive in this inhospitable place. As we drove, we paused sometimes to admire splendid oryx, an antelope with intimidating horns and a masklike face of black and white, and occasional ostriches, bulbous and ever alert. As we ascended a hill of rounded boulders from which to view the sunset, we passed an oryx lounging just 20 feet from the track. Whereas other oryx fled if we came too close, this beast regarded us with utter calm, like some mythical deity that had decided it would be amusing to transform into an animal for a while. 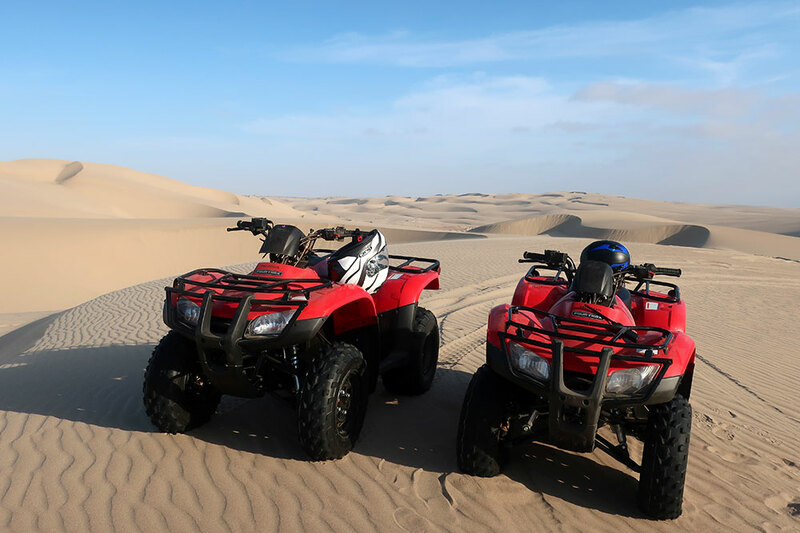 We also enjoyed an ATV excursion at Shipwreck Lodge on the Skeleton Coast. The property had only just received permission to use ATVs, because they would ruin the sensitive ecosystem between the lodge and the sea. In the sand there, animals like geckos and dancing white lady spiders dig burrows, which would collapse if run over. But behind the lodge, a great sea of golden-gray dunes extends to the horizon and beyond. Nothing lives in the soft, shifting dunes, the surfaces of which are too far from groundwater for vegetation to reach. There, all it takes to erase the tracks of an ATV is a stiff wind. Walking the dunes would have been exhausting, but exploring them by ATV was exhilarating. The oblique light of the late afternoon turned the waves of the sand sea into a massive work of abstract art, a composition of light and shadow contrasted by the turquoise sky. I felt an incredible sense of expansive freedom speeding across the sand, especially since we had the vast and beautiful landscape entirely to ourselves. Traversing the dunes on foot kept us grounded, emphasizing the immense size and power of the desert. Skimming them in an ATV felt uplifting. It would have been a major mistake to pass up such an experience.